POSH View was a business-to-business (B2B) hardware-based startup company based in Calgary, Alberta Canada. The company’s goal was to create a suite of interactive display products that could be integrated and utilized in commercial applications. Zyris worked with the POSH View team to design and develop the underlying infrastructure, operating system and software behind POSH View’s flagship product, the iMirror. 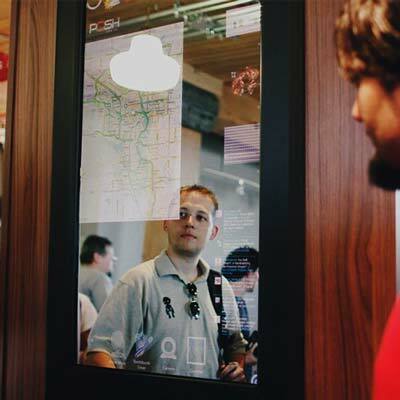 The iMirror is a proprietary display device that allows users to communicate with the connected world through apps with a fully interactive multitouch interface. At the time of development, there were few cost effective off-the-shelf solutions for small to medium sized businesses interested in interactive information kiosks for their customers. Zyris designed and developed the Linux based operating system that controlled the multitouch interactive mirror display called the iMirror. The multitouch functionality supported more than simple gestures. The iMirror allows users full control to manipulate apps and content throughout the screen. The mirror included a full suite of applications that allowed the user to do everything from check their email, update their schedule, catch up on social network feeds, work out their wardrobe woes and more, all while watching their favorite program with built-in TV streaming functionality. The iMirror was the flagship product and precursor to a suite of interactive digital display products produced by the POSH View team. These products, including touch tables, interactive touch walls, and interactive display kiosks were targeted towards a variety of industries including retail, real-estate, professional services, and tourism. Each product offered its own unique suite of applications and special interactive features dedicated to its target audience.